Ridiculously over-engineered? Or the perfect case for your iPad mini no matter where you're headed? Simply put, the Griffin Survivor Case is the most protective case we've ever built. 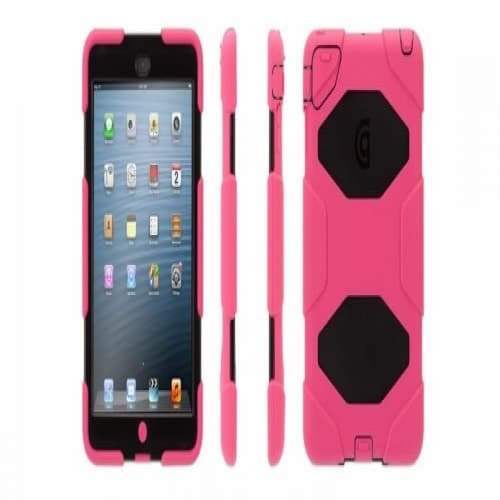 Tested and certified to meet or exceed US Department of Defense Standard 810F, Griffin's Survivor Military-Duty Case is designed from the inside out to protect your iPad mini from extreme conditions ... dirt, sand, rain, shock, vibration and a host of other environmental factors. Survivor is built on a shatter-resistant polycarbonate frame clad in rugged, shock absorbing silicone. A built-in screen protector seals your Multi-Touch display from the outside environment, while hinged plugs seal the dock connector, camera lens, headphone port, hold switch and volume controls. The included stand clips on, then folds open for landscape viewing and typing. Survivor is independently tested and verified to meet or exceed environmental testing standards for blown rain, blown dust and grit, vibration, shock, temperature and humidity. Features - Independently tested and certified to meet conditions outlined in US Department of Defense MIL-STD-810 - Integral Display shield deflects wind and rain (Test: up to 200 mm/hr for 1 hour) - Rigid internal frame protects against shocks and drops (Test: drop on flat concrete surface from 6'/1.8 m) - Sealed ports block blown sand and dust (Test: up to 18 m/sec for 1 hour) - Silicone cladding blocks vibration (Test: 18 hrs at 20 to 2000 Hz) - Includes multi-position workstand Technical Specifications - Product Height 8.01" - Product Width 5.38" - Product Weight 7.75 oz. - Product Depth 1.12"